and prepare to complete it. tax information directly into the FAFSA. ready before Oct. 1 can expedite the process. form of financial aid, so it’s important all families complete it. The easiest and fastest way to fill out a FAFSA is at www.fafsa.gov. free. 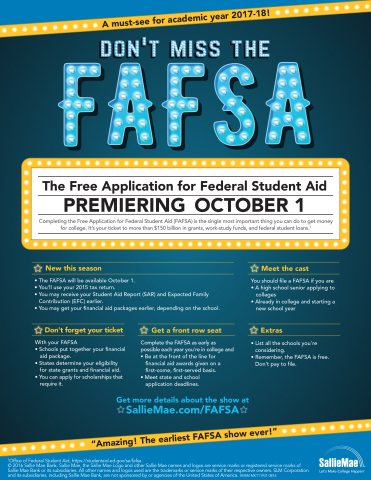 Never pay a fee to file the FAFSA, and make sure to file at www.fafsa.gov. state deadlines for completing the FAFSA, is available at https://studentaid.ed.gov/sa/fafsa. things FAFSA on Sept. 21 at 1 p.m. EDT. Use #CampusChat to participate.